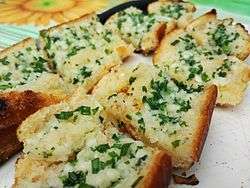 Garlic bread (also garlic toast) consists of bread (usually a baguette or sour dough like a ciabatta), topped with garlic and olive oil or butter and may include additional herbs, like chives. It is then either grilled or broiled until toasted, or baked in a conventional or bread oven. It is typically made using a French baguette, or sometimes a sourdough like ciabatta which is partially sliced downwards, allowing the condiments to soak into the loaf while keeping it in one piece. The bread is then stuffed through the cuts with oil and minced garlic before baking. Alternatively, butter and garlic powder are used, or the bread is cut lengthwise into separate slices which are individually garnished. Commercially manufactured frozen garlic bread was developed in the 1970s by Cole's Quality Foods in Muskegon, Michigan.